Exterior painting might be the single most important maintenance project you can do to care for your investment. 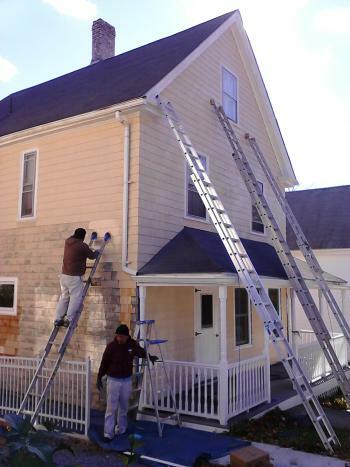 Menjivar's Painting exterior painters are experienced in protecting your largest investment. Extreme temperatures, wind and rain can wreck havoc on exterior paint. Menjivar's Painting painters create lasting impressions! Experience to do it right, the first time - Menjivar's Painting has been painting exteriors since 1998. Menjivar's Painting's exterior painters know how to prepare and paint all types of exterior surfaces and exterior materials including wood, plastic, and metal. Additionally we have plenty of experience painting clapboard, shingles, stucco, decks, railings, doors, windows, and more. Your home or business is in great hands with Menjivar's Painting's experienced exterior painting professionals. Fair Pricing - Priced just right, Menjivar's Painting exterior painting jobs are always competitive and what you would expect to pay for a quality job. Find out today how affordable Menjivar's Painting's exterior painting service truly is. Call today for a free quote. Satisfaction Guaranteed - Menjivar's Painting guarantees that you will be pleased with your exterior painting. The project will be done to your expectations and Menjivar's Painting goes the extra mile to make sure you are not only pleased, but actually ecstatic with your newly painted exterior!